The documentation and institutional collection of Australian children's play activities provides fascinating insights into the everyday cultures and practices of children, and by extension, of the broader social world that they inhabit. Detailed observational studies of children's play in Australia date from the 1950s, and demonstrate how the dynamics of continuity and change within traditional playlore may reflect broader cultural and social influences on the play lives of children, including such factors as consumerism, popular culture, national and community histories, and geography. There is a diverse historical and contemporary material culture associated with play, ranging from knucklebones to swap cards to electronic devices. There are also intangible aspects of play cultures, such as skipping and chanting games, spoken and sung words, stories and physical movements. However, in practice, children's play consists of the fluid interaction between such tangible and intangible forms. 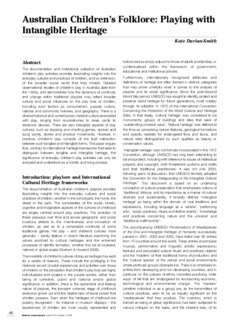 This paper argues that, contrary to international heritage frameworks that seek to distinguish between tangible and intangible heritage, the significance of everyday children's play activities can only be analysed and understood as a holistic and living process.